January 31, 2013 (Opelika, Ala.) – Starting at the back of the field for Friday’s BMW Performance 200, the no. 171 and no. 181 APR VW Jetta GLI’s were on the move at the start of the two hour and thirty minute Continental Tire Sports Car Challenge. January 30, 2013 (Daytona Beach, Fla.) – It was a charge from the back for the four drivers of the no. 52 APR Audi R8 Grand-Am. Ian Baas, Marc Basseng, Rene Rast and Frank Stippler’s combined efforts brought their silver Audi from three laps down to nearly win the GT race in the 51st Rolex 24 at Daytona. January 25, 2012 (Daytona Beach, Fla.) – A strong qualifying session highlighted a busy day for the APR Motorsport team at Daytona International Speedway on Thursday. 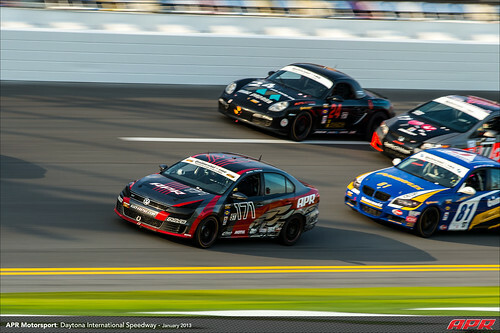 January 24, 2013 (Opelika, Ala.) – Looking to continue its race winning tradition in the Continental Tire Sports Car Challenge, APR Motorsport has finalized its driver lineup for this weekend’s BMW Performance 200 at Daytona International Speedway. 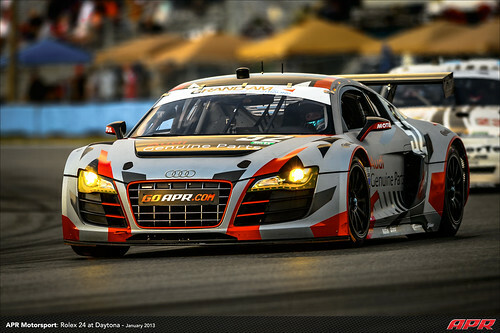 January 18, 2013 (Opelika, Ala.) – The changes are more than just skin deep for the pair of Audi R8’s that APR Motorsport will field at next weekend’s 51st Rolex 24 at Daytona. After last year, in which APR Motorsport helped to bring the Audi R8 GRAND-AM to it’s first Rolex 24, the team is returning with a pair of Audi R8’s capable of running at the front. Click the image for a high resolution version! APR Stage III Raffle Winner Announced! Congratulations to Kris J. of New Jersey for winning the APR Stage III Raffle! You can read his reaction online at VWVortex. Thank you to everyone who participated and good luck again next season! 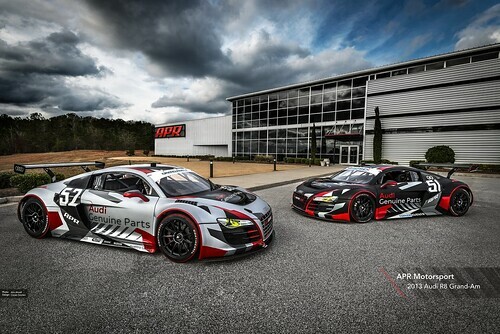 January 2, 2013 (Opelika, Ala.) – Not only is APR Motorsport unveiling a new-look testing livery for this weekend’s Roar Before the 24, but the team is proud to announce its driver lineup for the 51st Rolex 24 at Daytona. Americans Matt Bell and Alex Figge will join Canadians John Farano and Dave Lacey in the no. 51 APR Audi R8.